I took today to get my dad and father-in-law's cards done. Love that card, Christina and you can never make too many videos. Thank you for what you do!! Great card. I really like the sailboat. Great card, love the textured background. Christina! That is a gorgeous card! I love all the texture! I also like the sailboat! What a great idea! That PDDU has some hidden treasures in it, that's for sure! Great video! I love this card. I have to get a Cuttlebug. 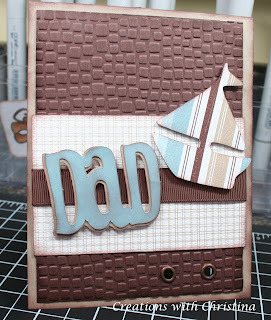 The embossing folders just give cards and scrap pages that extra wonderful touch. Great job! I hope to make one later this week, however I will have to use something else for the textured background..as I do not yet have that cuttlebug folder.